A thoracotomy is a surgery to open the chest wall. The surgery allows access to the lungs, aorta, heart, diaphragm, and spine. Depending on the disease location, a thoracotomy may be done in the center, or on the right or left side of the chest. You will be placed on your side with your arm elevated. An incision will be made between 2 ribs, from front to back. The chest wall will then be opened. In some cases, the doctor may take a different approach. The doctor can then do whatever procedure needs to be done in the open chest. When the procedure is done, one or more chest tubes will be placed. The tubes will make sure that blood or air does not collect in the chest. The chest wall will be closed. The incision is closed with stitches or staples and bandaged to prevent infection. You will be closely monitored in the intensive care unit. 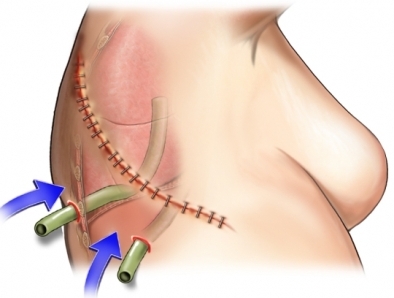 For some, a thoracotomy can lead to a chronic pain syndrome. It is usually described as burning pain in the area of surgery. It may be associated with increased sensitivity to touch in this area. It usually lessens over time, but you may need to see a pain specialist if the pain persists. The usual length of stay is 5-10 days. Your doctor may choose to keep you longer if complications arise. You will have IV lines and tubes in and around your body. Some of the lines and tubes will help you urinate, breath, and get nutrition. Most of the lines and tubes will be removed as you heal. You may be given antibiotics, pain medication, or anti-nausea drugs. You may need to cough and do deep breathing exercises to keep your lungs clear. This may require the use of a device to help you breathe deeply (an incentive spirometer). Get out of bed often and sit in a chair. Slowly increase your activity as tolerated. If you smoke, talk to your doctor about how to successfully quit. You may need to avoid places that expose you to smoke, germs, or chemical irritants. Follow your doctor's instructions. Athanassiadi K, Kakaris S, Theakos N, Skottis I. Muscle-sparing versus posterolateral thoracotomy: a prospective study. Eur J Cardiothorac Surg. 2007;31(3):496-500. Levy MH, Chwistek M, Mehta RS. Management of chronic pain in cancer survivors. Cancer J. 2008;14(6):401-409. Ohbuchi T, Morikawa T, Takeuchi E, Kato H. Lobectomy: video-assisted thoracic surgery versus posterolateral thoracotomy. Jpn J Thorac Cardiovasc Surg. 1998;46(6):519-522. Wildgaard K, Ravn J, Kehlet H.Chronic post-thoracotomy pain: A critical review of pathogenic mechanisms and strategies for prevention. Eur J Cardiothorac Surg. 2009;36(1):170-180.